In 1834, Brooklyn is incorporated as a city, but most of Brooklyn is still farmland and woods, except for a suburb that is now Brooklyn Heights. 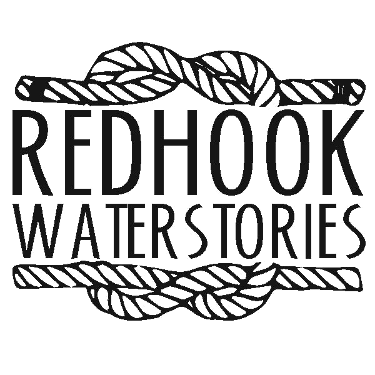 At that time, Red Hook is a watery place, with tide mills ponds, corn fields, orchards, the Bull Creek canal and middens (large piles of oyster shells, the remains of a long history of Lenape meals). Almost no one lives here. That changes abruptly in the late 1840s when the canal is filled, and the Atlantic Dock Company builds a man-made harbor with granite warehouses. The Atlantic Dock (also called the Atlantic Basin) was envisioned by Col. Daniel Richards, a developer who set Red Hook on the path to becoming one of the world's major commercial ports. While living in upstate New York, Richards saw the powerful economic effects resulting from the opening of the Erie Canal in 1825. Looking to capitalize on it, he moved to Brooklyn to build a terminus that could handle all the boats and products coming down the Canal. Then as now, change triggers NIMBY complaints. The lament is that the maritime action ruins the pastoral view, so “nice” people are moving away from Columbia Street. During the next century, Atlantic Basin is always packed. Freighters, tugs, barges, grain elevators, and passenger ships cram the place. A major step in the abolition of slavery takes place here when the slave ship ERIE is sold at government auction, impounded for breaking laws against shipping humans for the slave trade. President Abraham Lincoln is involved in the matter and uses it as a national example. The Captain of the ERIE Nathaniel Gordon is executed for his crime, the only American to receive this punishment. Later in the 1800s and 1900s, refugees and waves of immigrants arrive by ship including the first Puerto Rican community in the city. Several modernizations erase the Victorian cobblestones and looming brick and granite warehouses. Today’s Atlantic Basin of sprawling asphalt and flimsy metal sheds arrives in the late 1950s and early 1960s when about half the waterspace is filled (the water used to reach almost to Imlay Street) and the last historic buildings are leveled. This modernization is promptly out-of-date because the introduction of containerization means that piers designed to handle break-bulk cargo (stuff in barrels and sacks and on pallets) have less and less use. The waterside freight railroad chugs along until the late 1980s. Freight activity picks up again in the early 2000's filling the Pier 11 shed with cacao beans under management by ASI (American Stevedoring Inc), but real estate speculation and plans for the cruise terminal soon flatten the freight story. WHO OWNS AND RUNS THIS NOW? Atlantic Basin was part of the Red Hook Container Terminal (RHCT) until 2005, when the City said they needed it to support the Brooklyn Cruise Terminal that was being planned for Pier 12, the pier along the Buttermilk Channel. The current “Atlantic Basin” has more asphalt than water and runs south from RHCT to Wolcott Street, and east to Imlay Street and includes Pier 11 (our home) and its warehouse, along with Pier 12 and its warehouse (converted into to the cruise terminal). Most of the site (minus a chunk along Imlay Street that the City owns) is owned by the Port Authority of New York and New Jersey, a bi-state agency, and rented to the Economic Development Corporation of New York City (NYC EDC), a non-profit that does major economic planning and real estate management for the city. The EDC rented the Pier 11 shed to Phoenix Beverage who, a few years later, sold their beverage distribution business and became the stevedoring company that now runs RHCT. Atlantic Basin is home to a quirky-as-Red-Hook combination of users. The shed tenants include the Secret Service, businesses renting party supplies and box trucks to the film industry, a recycler of glass and plastic bottles, a firm installing internet cables, a restorer of vintage cars and others. The Pier 11 boat tenants must represent the most diverse array of boats on a NYC pier: our historic oil tanker, a tall ship, replica paddle wheeler, tour boats and dinner boats, a formerly sunk ferry, and the rusty remains of a 1931 yacht that is being brought back to life. PortSide NewYork is located on the historic ship MARY A. WHALEN at the south end of Pier 11. The historic name for the south end of the basin is “Clinton Wharf,” and on June 1, 2017, service starts on the NYC Ferry that has a dock on Clinton Wharf. That ferry is likely to transform Red Hook, just as Atlantic Basin transformed Red Hook in the 1850s. Below are some Atlantic Basin WaterStories. Many more can be found by browsing the "subject" Atlantic Basin in the top menu, or by following tags. More content coming over time! Check back for updates! Advertisement: "Composite Oil Works. Atlantic Docks Brooklyn. Gwynne & Co. proprietors. Composite oils for lubricating, burning, wool dressing, color grinding, painting, &c. Also rosin oil for rope makers..."
A drawing of the Atlantic Basin's warehouse and docks by Wade, for Gleason's Pictorial, 1851. The tall structures shown by the water's edge at right are grain elevators, used to move loose grain from the ship to the warehouse. The Atlantic Basin was the home to hundreds of Erie Canal boats during the winter months. Families, including children, lived on the the boats, tending their floating homes, until the ice melted and they could begin shipping produce again. 16 The Rich Leave the Waterfront, 1899, "The Atlantic docks have killed the Heights"
Postcard of a ship docked in the Atlantic Basin, one of a series of postcards of Brooklyn views printed by the Brooklyn Eagle newspaper. An aerial view of Atlantic Basin, ca. 1965. In the foreground is the rail car float; several cargo ships are in the background. Neither the buildings nor the car float exists today. The MARY A. WHALEN, a re-purposed oil tanker, is the flagship of the non-profit PortSide New York (creators of Red Hook WaterStories). She is docked in historic Atlantic Basin.